Canson Montval Watercolour Pad A5 185gsm A 100% cellulose water colour paper, medium (cold press), Acid free, natural whiteness (does not yellow), rot and mildew resistant. Watercolour Pad Roymac Rains 230 x 305 mm - 300gsm - 12 sheets of Acid free 100% cotton fibre. Cold press Medium. A perfect surface for all water based media. Watercolour Pad Roymac Rains A3 - 300gsm - 12 sheets of acid free 100% cotton fibre - Cold press medium - A perfect surface for all water based media. 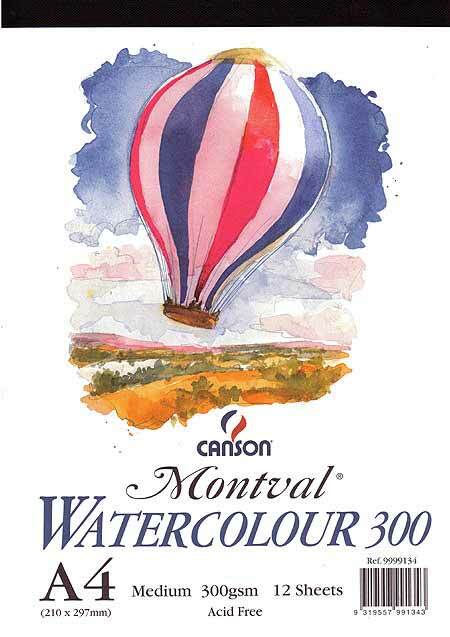 Canson Watercolour A5 Pads- Montval Rough 270gsm A 100% cellulose water colour paper Rough (Torchon),Acid free, natural whiteness (does not yellow), rot and mildew resistant. Canson Watercolour A4 Pad - Montval Rough 270gsm.